The Army is reconsidering the case of a Green Beret who was paralyzed last year when he dove headfirst into shallow water and now faces an "other-than-honorable" discharge from the service that could threaten his medical care. Sgt. 1st Class Timothy Brumit became paralyzed from the chest down in July 2015 when he attempted to rescue what he believed was a girl drowning. The Army deemed his actions were reckless and negligent because of alcohol and drug use. Media attention on the case led Lt. Gen. Kenneth E. Tovo to urge U.S. Army Human Resources Command to "reconsider" the determination, Fox News reported Thursday. 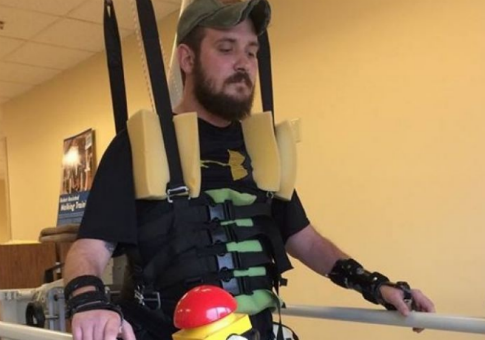 "[T]here are unknown factors that likely contributed to SFC Brumit’s momentary lapse in judgment that resulted in his life-long paralysis," Tovo wrote in a memo. "Based on the totality of the circumstances, a review of these unknown factors warrants reconsideration." Brumit, an Afghanistan and Iraq veteran who served eight combat tours, contends the Army "failed" him while he endured PTSD, traumatic brain injury, and substance abuse. Authorities determined Brumit had a 0.1 percent blood alcohol content when he decided to jump into the water and found traces of cocaine in his system. Brumit told the Daily Beast last week he had heard a Coast Guard alert for a missing girl and thought he spotted her drowning. "When I dove in, the water seemed to slip away and the sand bar was right there, and there was no turning back, and I hit my head," Brumit said. "I tried to shake it off … and realized I’d heard something break. I thought, oh my God, I’ve broken my neck." Army officials obtained Brumit’s toxicology report without his permission as they visited him in the hospital, leading to the veteran’s year-long battle against a potential discharge. Rep. Duncan Hunter (R., Calif.) lauded the Army’s decision to reevaluate the case. "The Army hates to open boxes up," Hunter told Fox News. "The fact that they kicked it back at all makes me optimistic." This entry was posted in National Security and tagged Army, Duncan Hunter, Military. Bookmark the permalink.